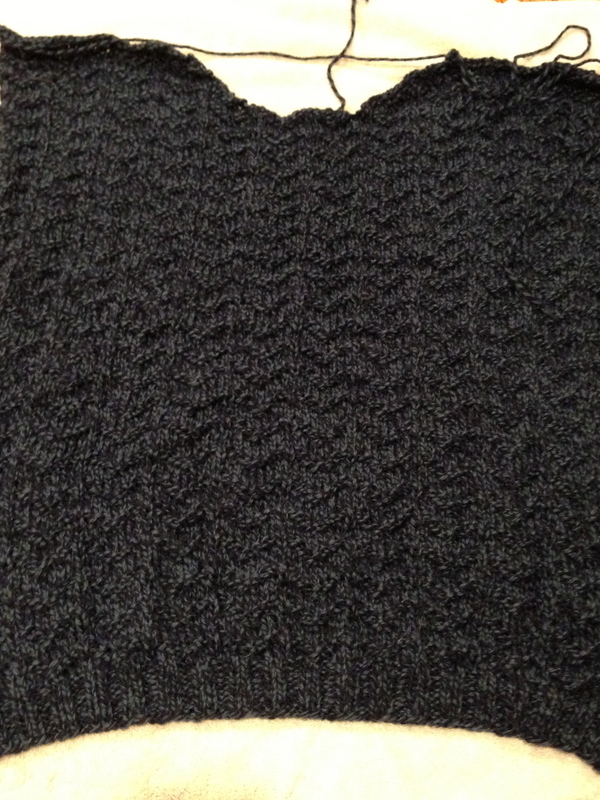 I have been diligently working away on my son’s sweater. It’s funny how quickly things work up if you spend time with them daily! I really love how this is turning out and more importantly, my son does too! The pattern detail is the same for the front as for the back and I have now memorized it so things are moving more quickly. I decided to knit both sleeves at the same time so they turn out exactly the same. 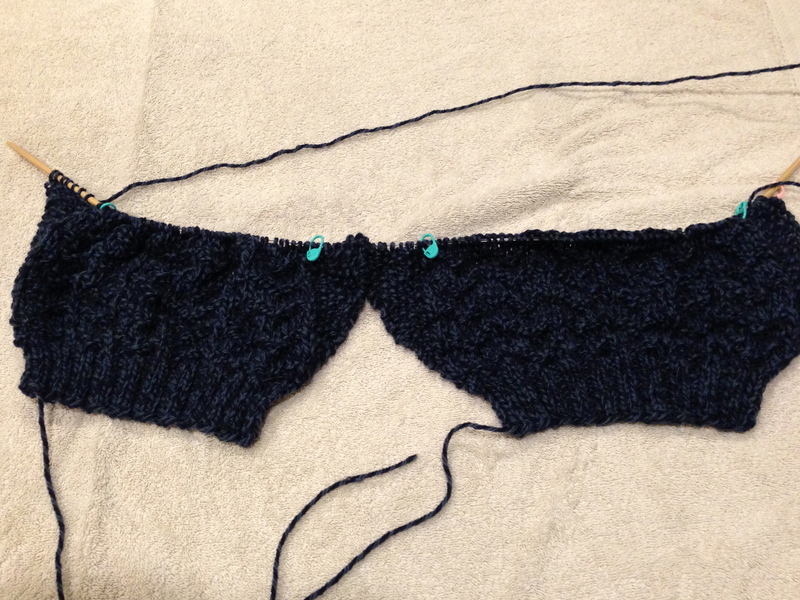 I usually knit the sleeves of a sweater like this – it’s completely psychological – once I finish, I’m done. 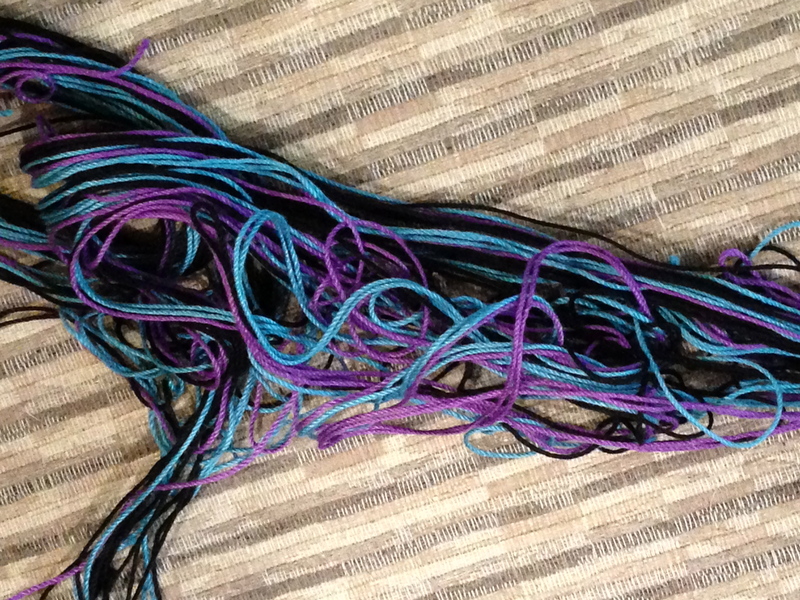 If I knit them one at a time, I have to start all over for the second one and for some reason that can be daunting. I guess it’s akin to the second sock syndrome. The only piece left to knit after the sleeves are finished is the hood. Then to sew it all together!! Whew! Hopefully I’ll be done soon so he can wear it during the winter months. 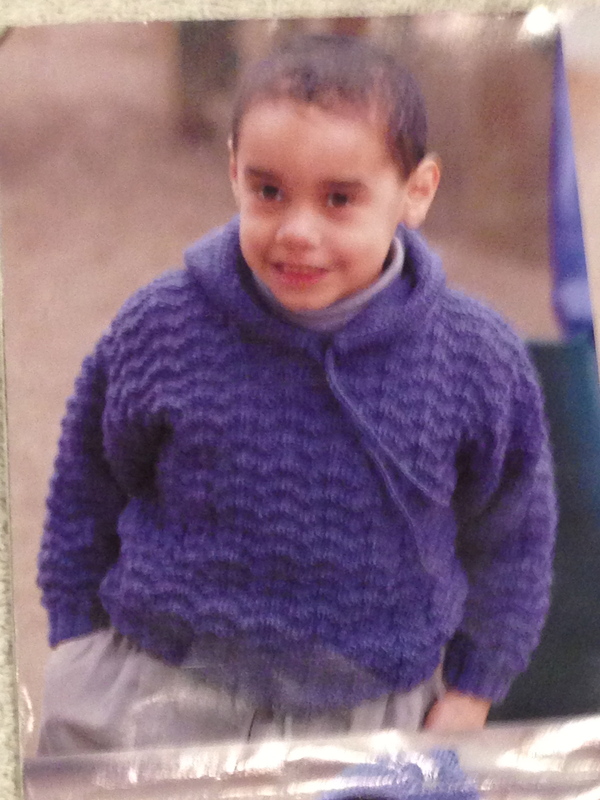 I knit this sweater years and years ago. 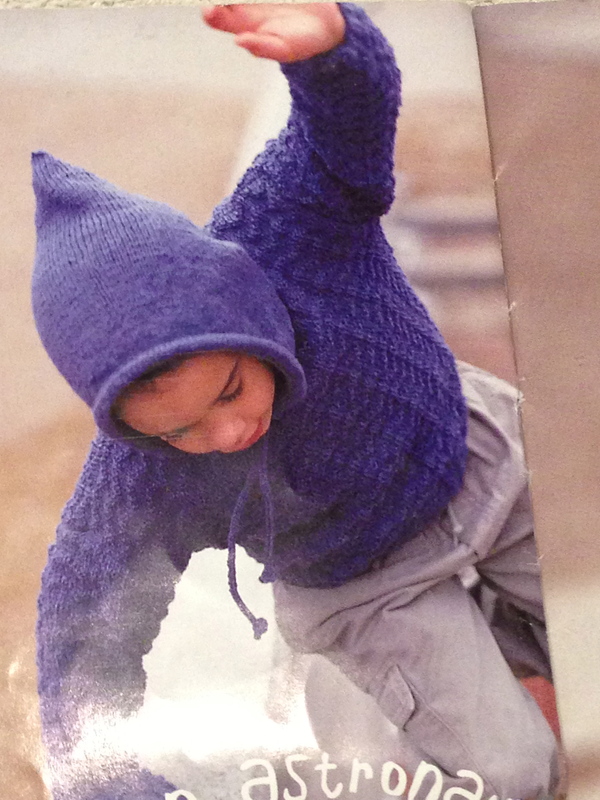 Picture from pattern book “Patons Kid Style” #938. This is not my son and not my work. This is the picture from the pattern book and I made it for my 13 year old son when he was in Kindergarten. He LOVES his sweater and wore it, and wore it, and wore it until it was too small for him – then he wore it some more! Now, sadly for him, it has been passed down to his younger brother who is also wearing it almost everyday now that it is slightly colder here. Picture from book “Patons Kid Style” #938. This is another view from the pattern book. Both sons love this hood – they like how pointy it is – they like the tie – they just like everything about it. Back of the sweater. Pattern #2 – Hoodie Boy. I have finished the back. My son picked out the yarn and as it was a slightly more bulky yarn than the pattern called for, I needed to move up one size for the needles. I am thoroughly enjoying the knitting process on this sweater. 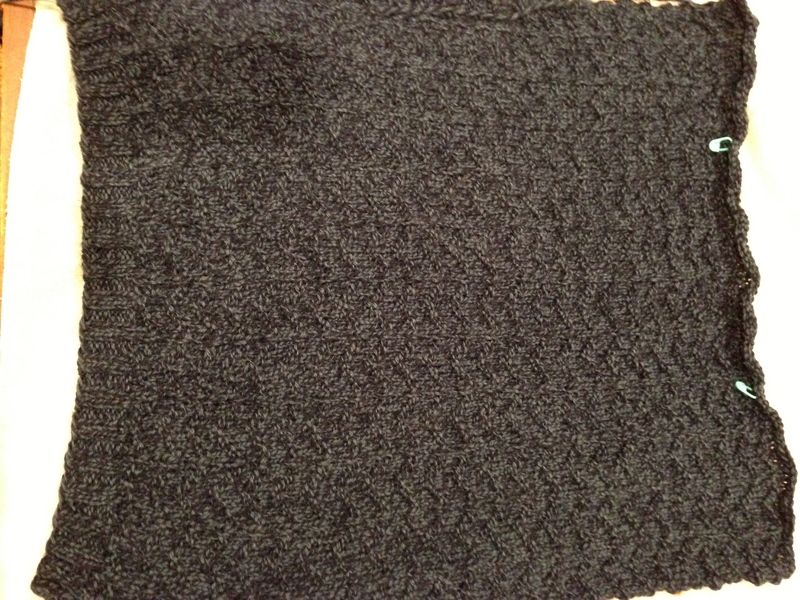 The markers above show where the shoulders will be when this get sewn to the front of the sweater. Close up of pattern detail. 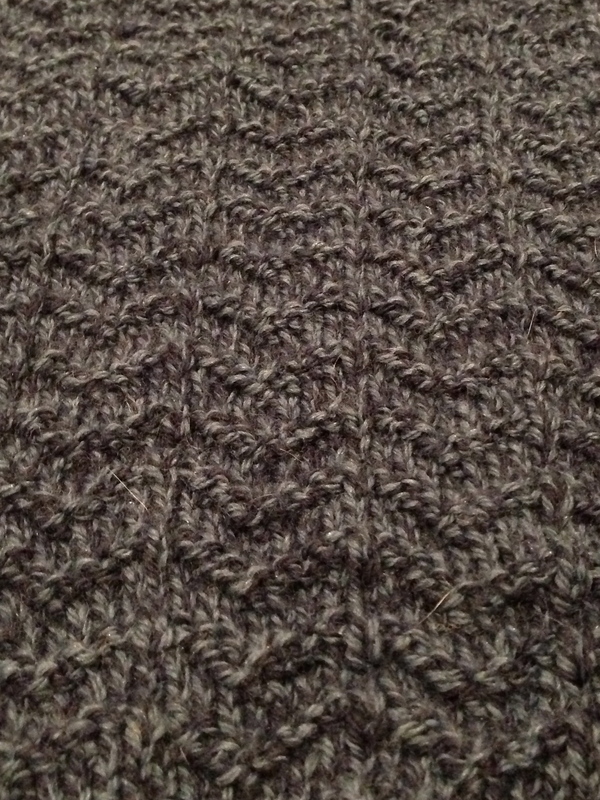 I love the detail produced by this stitch pattern. I brought this to show my students and they were amazed that you could produce a fabric like this using only knit and purl stitches. Something most of them already know how to do. I let them know that making a sweater is something that each and every one of them has the knowledge and ability to do – I hope one of them takes the plunge soon!! 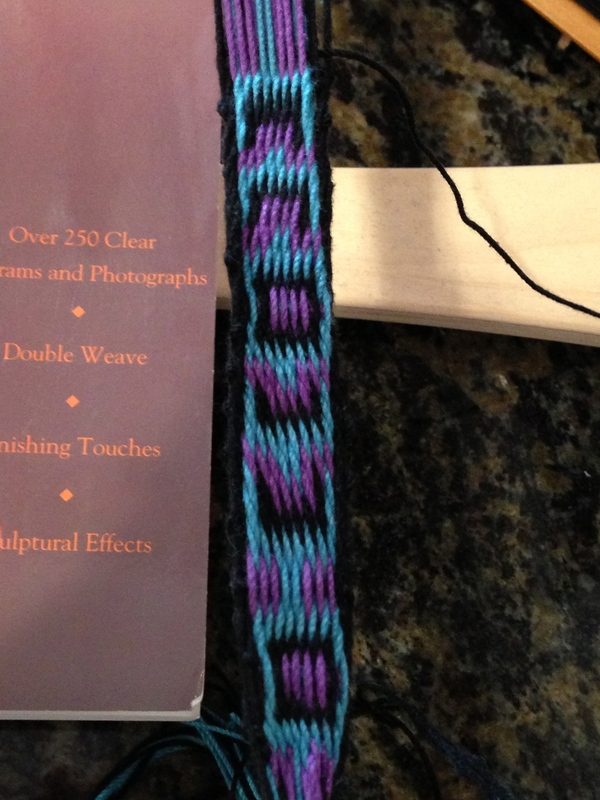 Learning a new craft form is always exciting to me! The book I am using to learn with. these weaving cards. I started reading the book just as soon as it was delivered to my doorstep. 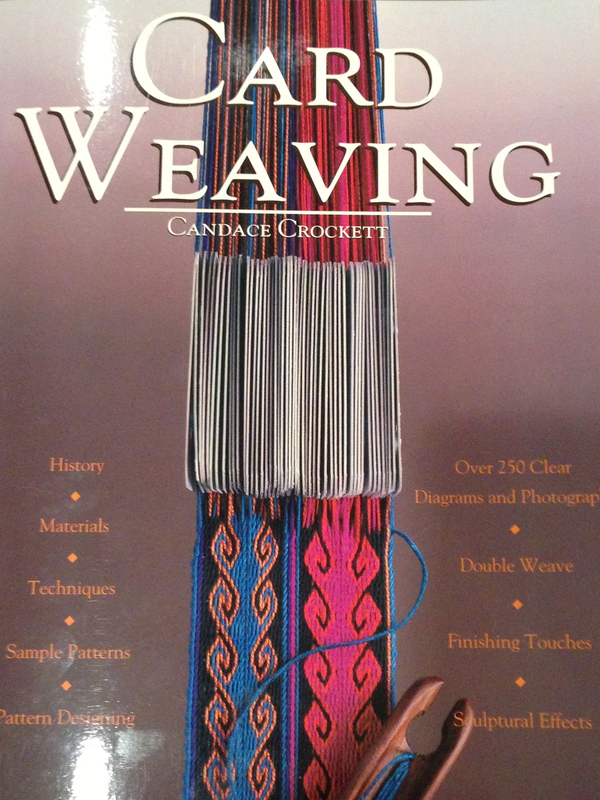 This ancient form of weaving has been around for a VERY long time. The earliest known card comes from a fourth century B.C. Spanish grave, but there is evidence of early card weaving that has been discovered in North Africa, Egypt, Europe, Asia, and Iceland. It was a time consuming process getting the cards threaded up. 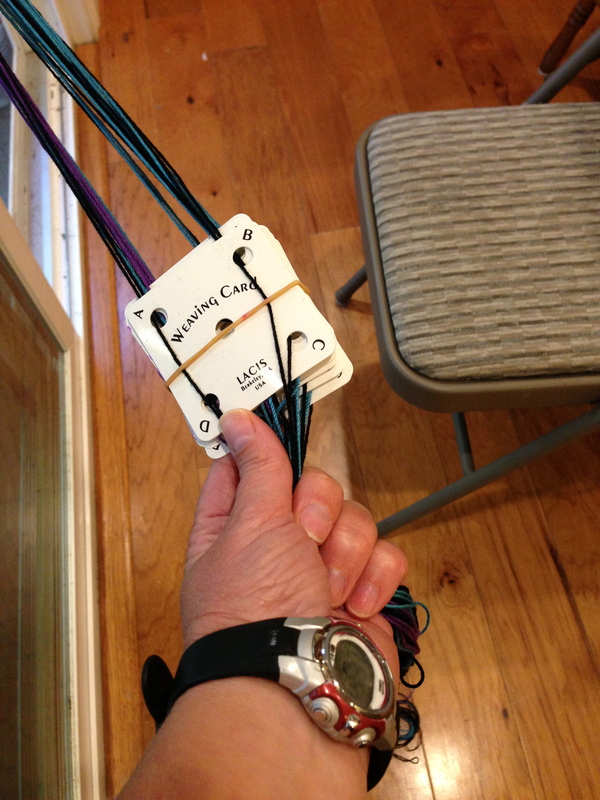 There are only 10 of them, but each one has to be threaded in a specific way with a specific order of threads. Just to give you an indication of how easy and straight forward my first sample will be, by contrast some of the fabric discovered that was created by this art form had 272 to 340 threads PER INCH!! 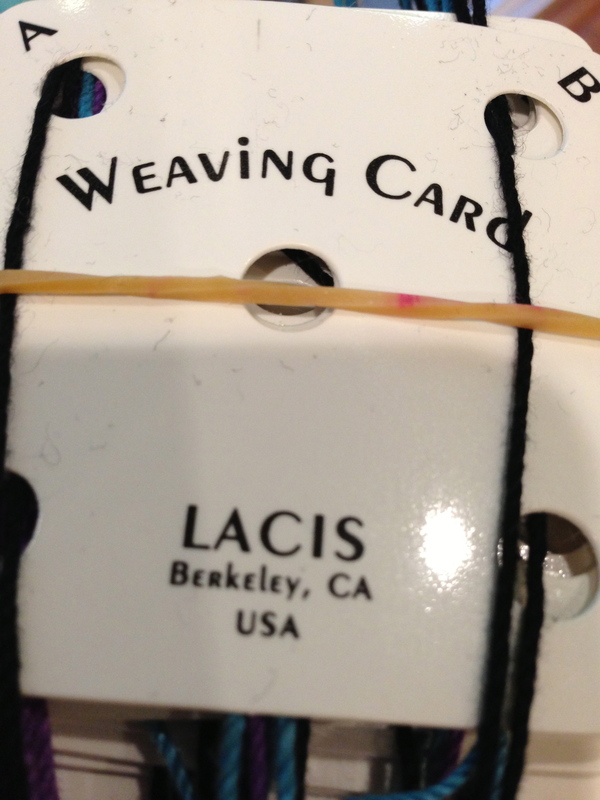 And some of the bands with this thread count were between 2 and 5 inches in width. WOW!! Can you imagine how difficult it would be to thread all those cards (remember, 4 threads per card)? 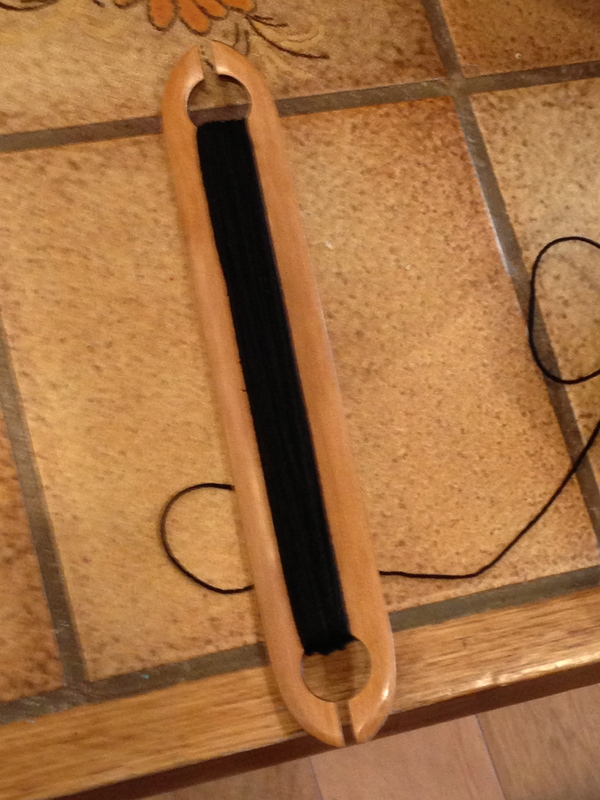 So…after threading the cards, one side of all the threads are tied to a stationary object like a door knob (as seen in the above picture). Tangles mess at the end of threading the cards. 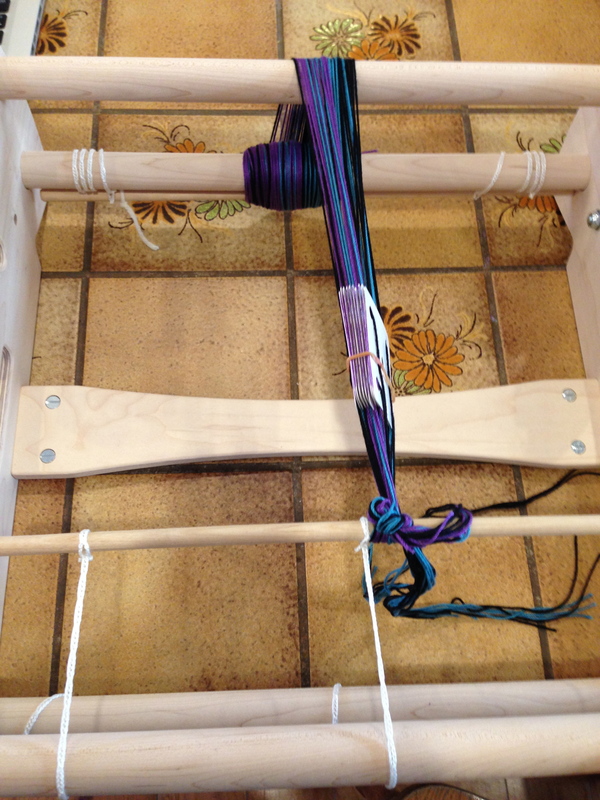 Then the tedious process of separating the threads at the other end so you have a nice smooth set of threads that you can use as your warp threads. The picture above clearly shows that I had a LOT of work ahead of me to get them all sorted out. Shuttle all loaded and ready to go. Here’s my shuttle all ready to go. My very first foray into card weaving.